I never go to far away from Arthur Koestler in depictions of systems theory in holarchies without having to come back to source. I always find more to discover in his thoughts. 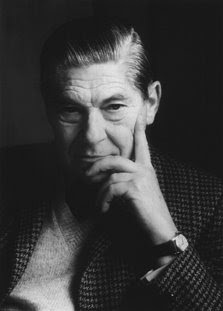 In Chapter 14 of The Ghost in the Machine (1967) Koestler talks about life as open systems and the apparent defiance of entropy in the 'integrative tendency' of biological forms. I often wonder if it is our failure to develop the layers of physical laws that nest in holarchy that makes the irreconcilable differences of science and novel theory. We recognize the difference in energy, matter, information and meaning, and yet we try to apply the principles of one to the others without discrimination. What if were to develop a coherent approach to the principles of existence across these layers of perception? What if we were to develop principles that were not, as Koestler suggests, the absence of chaos - but were the principles for the presence of coherence? This parallel path is possibly the purpose of the field of apithology. It takes Koestler's invitation to look at what can be seen by its opposite counterparts and directs the inquiry to that source. Where this perhaps takes us - is towards the coherence of life.